The Bible is God’s Word to his people, so it has some important things to say! But let’s be honest … it can also be sort of puzzling. Now you can get relief for your confused cranium. Here’s how: Pick up this book, based on the NIV translation. Look up your questions. Learn about heaven, earth, angels, sin, creation, and more. Understand what the creator of the universe---your creator---is saying to you! A big thank-you to Zondervan for sending me this book for free in exchange for an honest review. I was no paid for this review and all opinions are 100% mine. I was excited to recieve this book because I thought it would be a fun addition to add to our Children's church service. The first thing I did was check what the book said about the holy spirit. I was a bit sad because it was very vague and as much as I understand each and every denominiation looks at the Holy Spirit a little bit different the answers for Holy Spirit were dull and lacked the power that comes from Holy Spirit. I think in most questions the answers are very brief which is ok because it allows the adult to answer questions more detailed and theological according to the person. 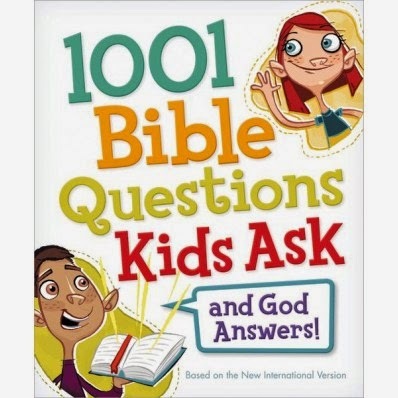 I am still not 100% sure if I will use this in children's church or not just based on knowing each of my teachers might not be ready to jump in and explain in more detail some of the questions. I do still like all the variety of questions in this book and the book includes a index so it is very easy to find a topic for the question. The book is only $6.99 and can be purchased from Zondervan.